In this photo taken by Geoff Blankenship for the Enquirer, we see the third place finisher Maddie Ullom of Mason and the fourth place finisher Hannah Doeger of Ursuline in the Girls Blue Division of the Moeller Primetime Invitational. 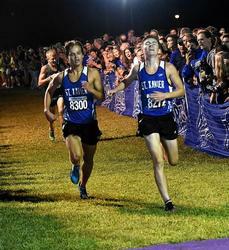 In the above photo taken by Geoff Blankenship for the Cincinnati Enquirer, we see the top two finishers in the Boys Blue Division of the Moeller Primetime Invitational Winner Joe Dugan on the right and runner-up Matt Hoak on the left. 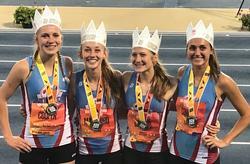 Kings Distance Medley Relay team of Jennifer Cooper, Gorley Gwyneth, Karleigh Conner, and Leah Maschino raced to a new city record of 11:55.05 at the New Balance Outdoor Nationals on Sunday, June 17, 2018 with their fifth place finish. 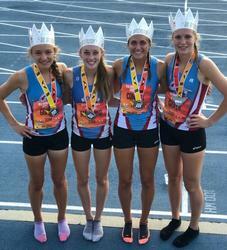 Kings Girls 4 x 800 relay team finished 4th at the New Balance Outdoor Nationals with a time of 8:59.62. Lakota East girls 4 x 100 relay team won the DI State Championship on June 2, 2018. Thanks to Richard Bryant of Lakota East for supplying the photo. 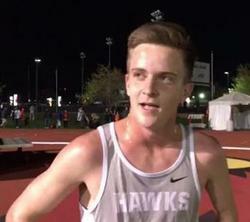 Dustin Horter of Lakota East did it again. One week after setting a new city record in the 3200m run, he set a new city record in the 800m run at the Wayne Invitational in Huber Heights running the time he is pointing at in the photo of 1:50.73 taking down the time of 1:51.76 set by Princeton's Jason Williams set way back in 1992. 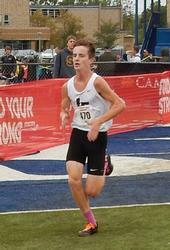 Dustin Horter won ten races this year including five of them under 15:00. His personal best was done at the MMC where he ran 14:36.77 He has won back to back state titles and this year added the Nike Cross Nationals Midwest Regional Championship to his resume. He has the fastest Cincinnati times at the VOA district, Troy regional, and National Trails Raceway state meets. In the photo above, he is shown winning his second straight state title in 2017. 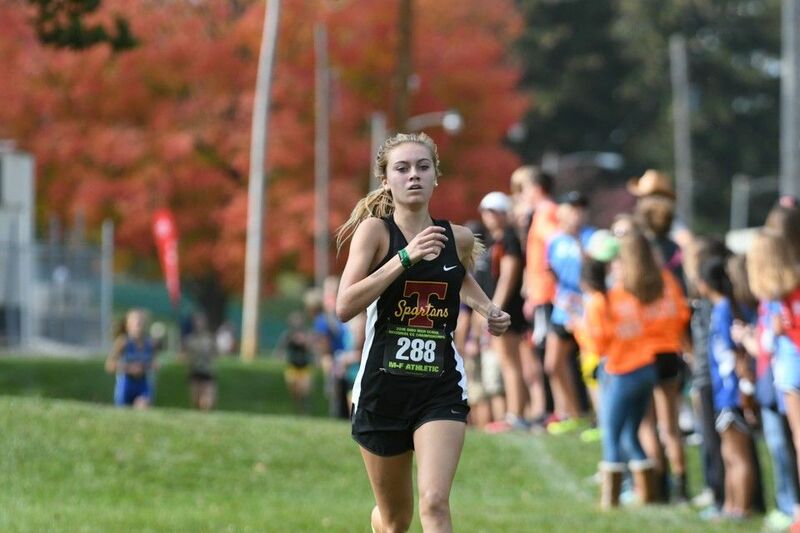 Turpin's Samantha Bush has the best place of any of our DI State quailifers finishing 10 at the OHSAA State DI Championships in 18:13.20. Her real claim to fame is that at the VOA District meet, she not only won the race by some 20 seconds but also set a course record for VOA winning in 17:37.02. 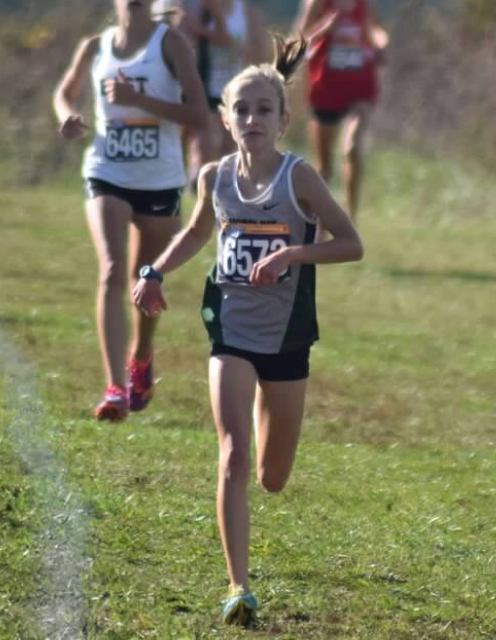 She also broke 18:00 at two other meets running 17:36.18 for her personal lifetime best at the Midwest Meet of Champions and 17:47.53 at the ECC league meet. 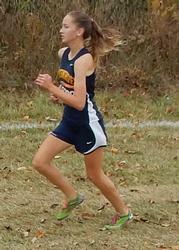 In the photo above she runs at the VOA District meet on her way to the course record for girls. 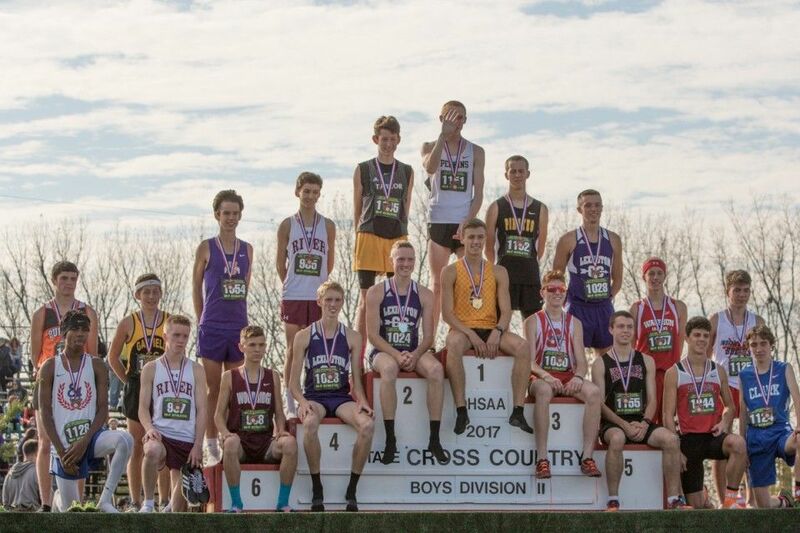 Members of the Summit Country Day Boys Cross Country team which finished as DIII State Runner-ups with a team score of 145 behind champion Ft. Loramie's 127 on November 10, 2018: Pictured from left to right with their place in the team race and their times are Dan Shisler (113th-19:05.8), Elijah Weaver (11th-17:04.6), Sean LaMacchia (112th-18:56.9), Andrew Wagner (39th-17:41.2), Evan Lakhia (33rd-17:36.6), Brian DeWine (16th-17:16.7), and Matthew Brumfield (46th-17:47.7). It needs to be said here that Summit had a perfect score at the VOA district meet going 1-2-3-4-5 to score the lowest possible total of 15. 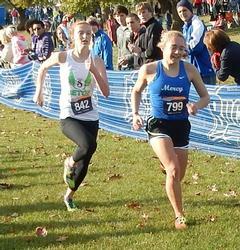 Ursuline Academy's Hannah Doeger was 8th in the DI State Championship race in a time of 18:24.1. Photo by Geoff Blankenship at Mason Invitational. Ben Bayless of Indian Hill (below) on the podium with his 6th place medal as his place was the best of any Cincinnati male athlete at the state meet. He ran 16:23.4 in the DII race. The 2018 track & field season has ended with state champions in four events, all in DI. Here they are in no particular order. The Withrow senior who has now signed with Arkansas won the Division I 100-meter hurdles on Saturday night. Smith recorded a time of 13.83 ((+2.4) to claim the championship. She also placed fifth in the long jump (18-feet-1.5) and fifth in the high jump (5-06) on Saturday to score all of Withrow's 18 points. Smith won the 300 hurdles twice as a junior and as a sophomore. She was the state runner-up in the 100 hurdles those two seasons but this year finally got the gold in the 100 meter hurdles in her career best time of 13.83. 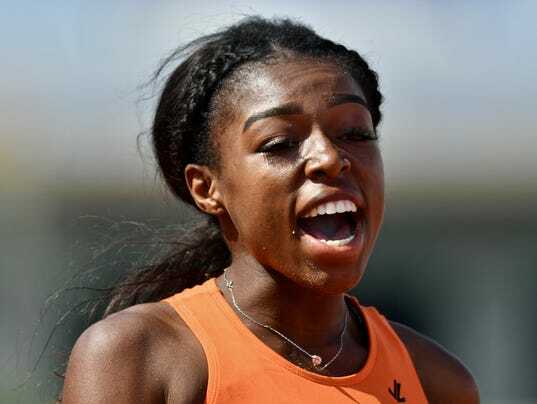 The big news here is that this time could have been a new city record besting the old record of 13.91 (0.6) set by Ayanna O’Neal of Withrow in the D1 State Prelims on 6/05/15. Unfortunately for her, the time can't count as the city record because of a tail wind of +2.4. Happiness is winning a state championship with your career best time. See J'Alyiea's joy in the photo below captured by Alex Vehr for the Enquirer. For the second-straight year, Lakota East's Dustin Horter is the king of the 1600 meter run, the so called metric mile of four times around the track. 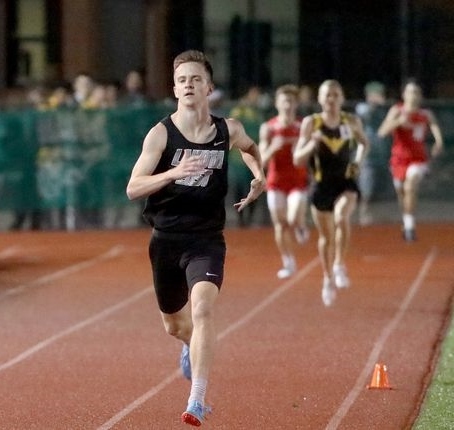 The Thunderhawks senior won the Division I 1600 meter run on Saturday night in Columbus recording a time of 4:06.96 to beat Dublin Coffman's Lucas Bons by three seconds. He also placed third in the 3,200, finishing with a time of 9:05.88. 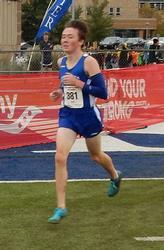 Dustin has now won two 1600-meter titles in track & field and two state titles in the 5,000 meters cross country race. 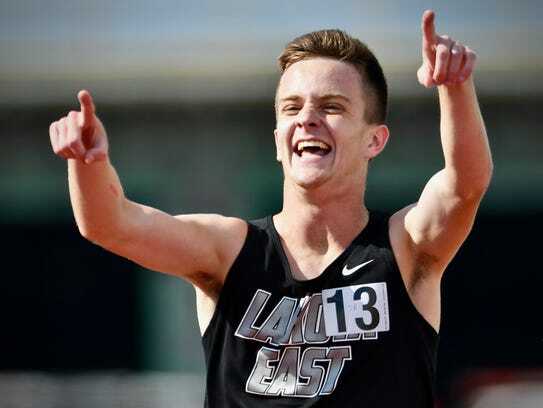 He graduates from Lakota East as the greatest distance runners in Southwest Ohio having set four new city records this spring in the 800m, 1600m, mile run and 3200m. Dustin has signed with Indiana University whose coaches were on hand for Horter's final races at state. He will run the mile run at the Brooks PR Invitational next Friday in Seattle. WA for his final prep race. 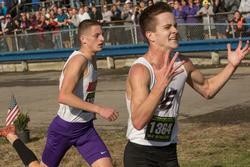 In the photo below taken by Alex Vehr of the Cincinnati Enquirer, Dustin signals his status as the best ever Cincinnati prep runner. 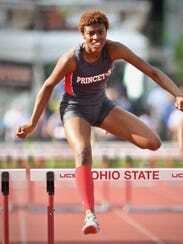 Princeton senior Angel Gazaway won the 300-meter hurdles by a half second Saturday night recording a time of 42.44 in the event to secure the Div. I state championship. Gazaway also placed seventh in the state in the 100 hurdles (14.54) and was a member of Princeton's 4x400 relay teams who placed fifth in the state with a time of 3:51.08. This was Gazaway's first year at state, and she credits first year coach Darren Braddix with pushing her to succeed at this level. It's every athlete's dream to win a state title and for Angel it came true this year. The photo below of Angel taken by Alex Vehr for the Enquirer shows her on her way to winning the state title. 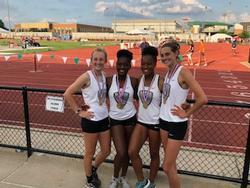 The Lakota East girls DI 4x100 team of Abigail Stoughton, Kaylyn Heath, Danielle Stoughton and Serena Clark were crowned DI state champs Saturday night with a time of 47.21. The Thunderhawks edged second place by 0.33. Three of the four finished as state runner-ups last year, all except Abby Stoughton. In the photo below taken by Alex Vehr of the Enquirer, we see the leadoff runner Abigail Stoughton beginning the race to glory. What we have witnessed in the last two weeks + has been nothing short of phenomenal. Lakota East’s Dustin Horter is the most outstanding distance runner our city has ever seen. One by one, he has been blasting every distance running record we have ever accumulated in our history into oblivion . 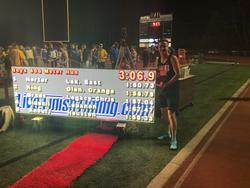 It all started with the Eastern Relays on Saturday, April 21, 2018 when he ran the 3200 meter run in 8:48.62 to take down our 3200m record from 2000 where La Salle’s Steve Padgett ran 8:54.90 at the Golden West Invitational in California. Dustin beat our existing record by 6.28 seconds and took over the 2018 national high school lead in the event. Some six days later on April 27th at Wayne high school in Huber Heights, another one of our cherished marks fell as Dustin ran 1:50.73 retiring our 800 meter record set in 1992 by Princeton’s Jason Williams in a state meet winning time of 1:51.76. Dustin not only established our new city record, but his time was the fourth best in the entire country this year. Last Friday night at Mason high school, Lakota East's Dustin Horter outdid himself breaking two of our city records in the process by not only destroying our records but only this time establishing a new all time state record in the 1600 meter run dropping Bob Kennedy of Westerville North’s time set way back in 1985 when he won state in 4:05.13. Dustin jaw dropping times were 4:03.40 in the 1600 meter run and 4:04.82 in the mile. Both times are the fastest recorded times in the entire country this year. Our previous records in these events were 4:07.2 mile run done by Colerain’s Mason Ward at the Golden West Invitational in 2000 and Dustin own record of 4:07.52 in the 1600 meter run done last year at the Greater Miami Conference meet last year. You have to be at one of these events to truly appreciate the excitement Dustin creates with his superlative efforts. Friday night at Mason, the crowd was on its feet roaring as Dustin came around the last turn and sprinted down the home stretch in the mile run. Thanks to Tony Tribble of the Enquirer, we have a photo of this iconic moment to share with you. What happens when your Garmin tells you that you put in over 800 miles of running before your very first high school cross country season? 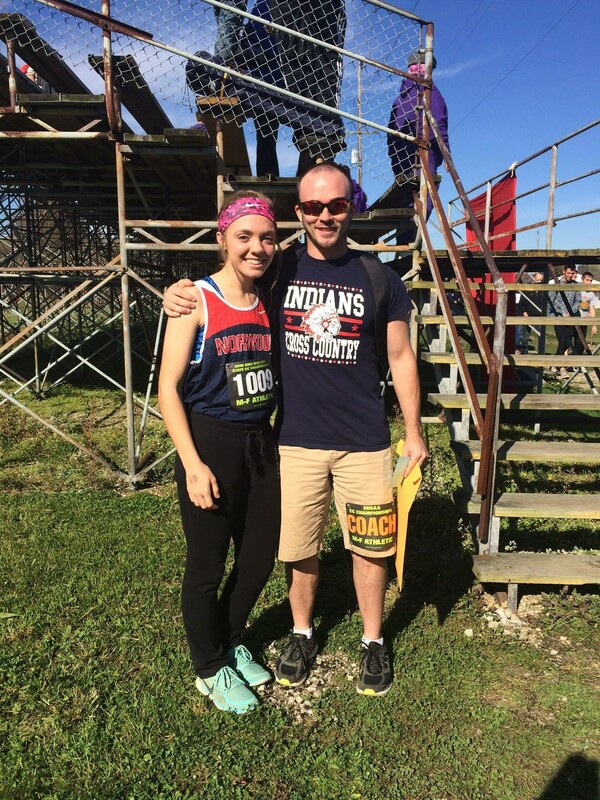 If your name is Maddie Baker, and you are from Norwood High School, you end up running 19:23, win the Norwood, Seven Hills, and Williamsburg CC Invitationals, finish 3rd in the American Division of the SBAAC and the Race B of the DII SW District, 10th at DII Regionals, and 52nd at the State meet. And you are named the South West Ohio Track and Cross Country Coaches Association DII co-Newcomer of the Year. But even though Maddie is the Newcomer of the Year, she is no newcomer to running success. As an eighth grader, Maddie ran the 1600m in a remarkable 5:34. That is a time that would be the Norwood High’s Girls 1600m school record if Maddie had opted to wait until she was in high school before she ran it. Finally, Maddie has a good person and a great teammate. And that means she has a lot of people who think highly of her and are willing to support her in her efforts to be a champion. According to Coach Guest, “what really makes Maddie Baker special is the support group around her. Maddie’s parents and grandparents are *“ALL-N” and attend every event.” Coach Guest is quick to note that Maddie’s “family” extends to Maddie’s teammates as well. 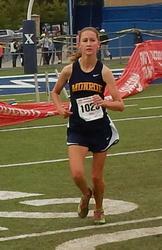 According to Coach Guest, Maddie’s teammate, Maliyah Mabry, “pushed her throughout her Junior High career” as they posted the 2 fastest Female Junior High Cross Country times in Norwood history” and Junior and Captain Alli Streaker supported Maddie’s transition to running 5k in high school from 2 miles in junior high. Congratulations to Maddie Baker of Norwood High School, the SWOTCCCA Girls DII co-Newcomer of the year. Felicia Krekeler is a freshman at Ursuline Academy. She led the season as the Lions’ #1 runner and led her team to a 10th place team finish in the 2016 State CC meet. 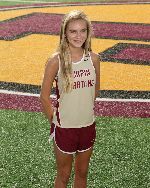 Felicia’s running resume includes a PR 18:36.3 and 11th place finish at the State meet, a 9th place finish at the Troy Regionals in 18:57.19, and a 2nd place finish in the District Race in 18:52.68. 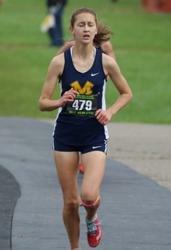 Felicia also won the GGCL Conference meet in 18:57.1 and was named GGCL Runner of the Year. 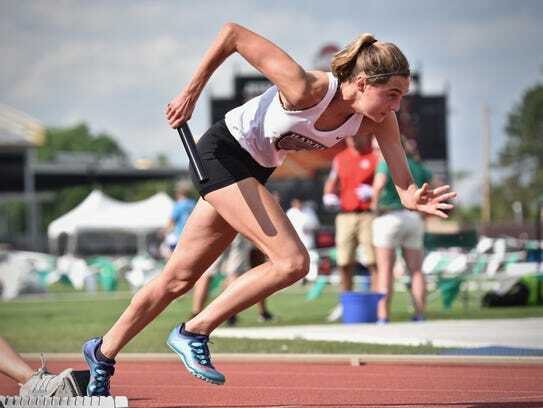 On the strength of those performances, and others, Felicia Krekeler has been named as the Southwest Track and Cross Country Coaches Association (SWOTCCCA) Girls DI Newcomer of the Year. 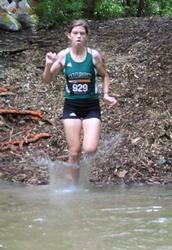 Congratulations to Felicia Krekeler of Ursuline Academy, the SWOTCCCA Girls DI Newcomer of the year. 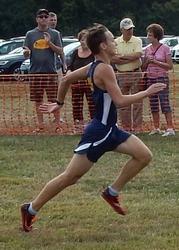 Dustin ran a school record 15:01 to become the Greater Miami Conference overall champion. He was the individual district champion, running 15:02, and the regional champion. 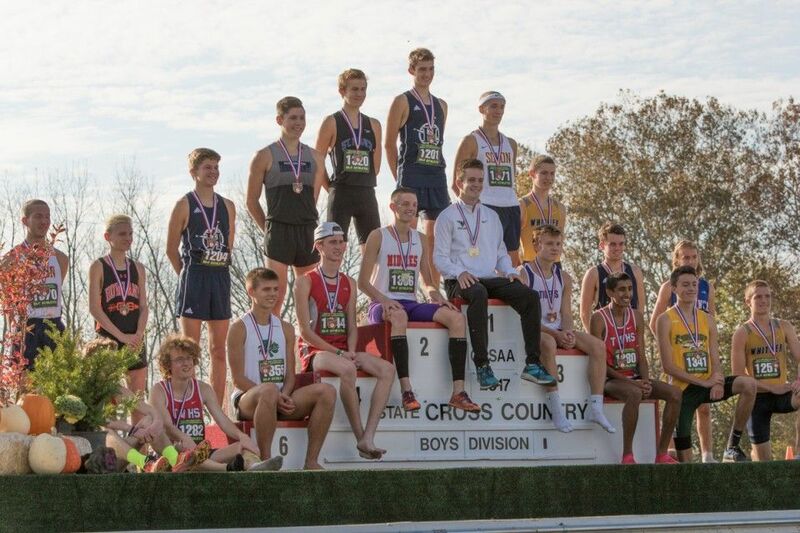 Dustin was the 2016 OHSAA Division 1 state champion in cross country with his 15:02.8 performance. Dustin qualified to the Nike Cross Nationals by placing 4th in the Nike Cross Midwest meet, resetting his own school record with a time of 14:59.9. 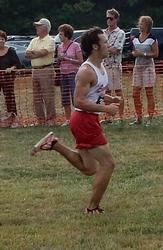 Zach Birdsall, Fairfield The Senior finished 6th in the GMC Championships. He finished 9th in the district and 18th at the regional and 60th at the state meet. His best time was 16:00. Peter Dauenhauer, St. Xavier The junior finished as runner-up at the GCL and district meet, fourth at the regional meet, and 20th at the state meet. His best time was 15:42. Ben Gothard, Turpin The senior was runner-up at the ECC Campionships, fifth at district, ninth at regionals, and 57th at State. He was the only representative from the ECC to qualify to state. His best time was 16:12. Kevin Lawson, Sycamore The senior finished the GMC Championships in 3rd place, he took 3rd place at district, 7th at regionals, and 53rd at state. His best time was 16:02. 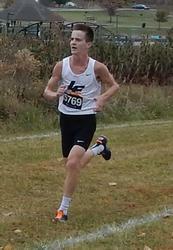 Dan Leonard, Lakota East The senior placed 8th in the GMC Championships. He placed 8th at district, 13th at regionals and 56th at state. His best time was 16:24. Mikey Loehr, Mason The senior finished 4th at the GMC Championships, he was the district champion, he finished 19th at regionals and 80th at state. His best time was 15:49. 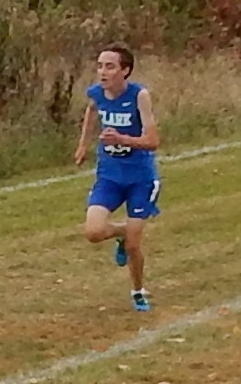 Will Morgan, St. Xavier The senior finished fifth at the GCL meet, fourth at the district meet, eighth at the regional meet, and 63rd at the state meet. His best time was 16:08. Chris Reischel, St. Xavier The senior won the GCL meet and finished third at the district meet, fifth at the regional meet, and 29th at the state meet. His best time was 15:52. Michael Uematsu, Mason The junior finished 5th at the GMC Championships, he was the district runner-up, he finished 6th at regionals and 58th at state. His best time was 15:55. 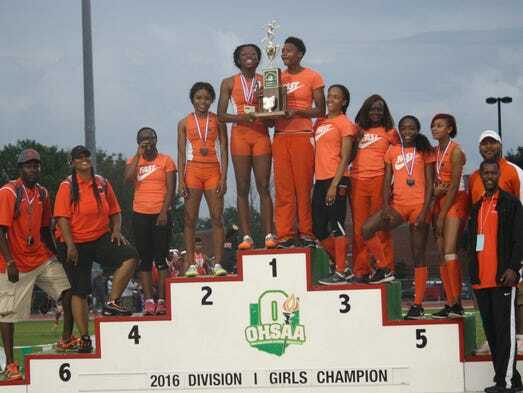 Withrow Girls won their second straight DI State Championship June 3, 2016 scoring a Cincinnati area record 64 points to outdistance second place Gahanna Lincoln with 53. 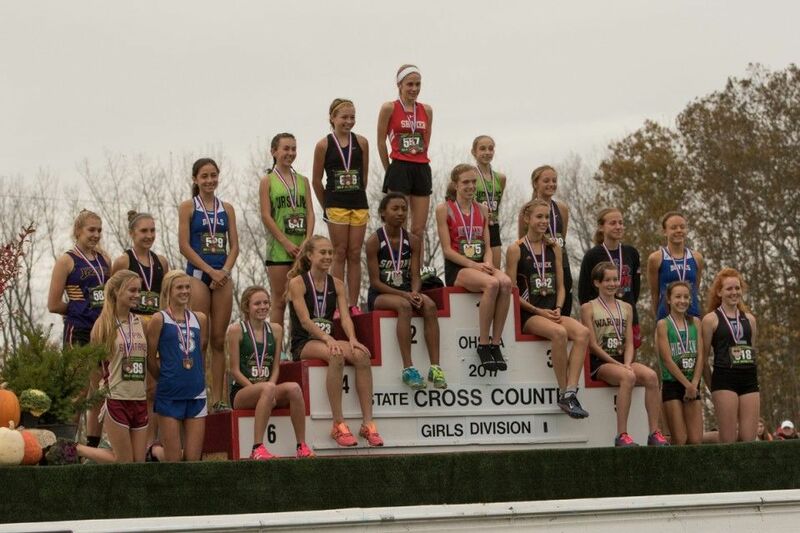 DI Girls - Athlete of the Year - Maddie Walker of Amelia - The freshman had the best finish at the state meet as she was 12th to garner an all state award. She was 12th at the regional and a district champion at VOA. DII Girls - Athlete of the Year - Rachel Ploeger of Monroe - The sophomore was 35 at state, fifth at the regional, and a VOA district champion. DIII Girls - Athlete of the Year. Laura Vilardo of Miami Valley Christian. The sophomore was 94th at state, 16th at regional, and a VOA district champion. 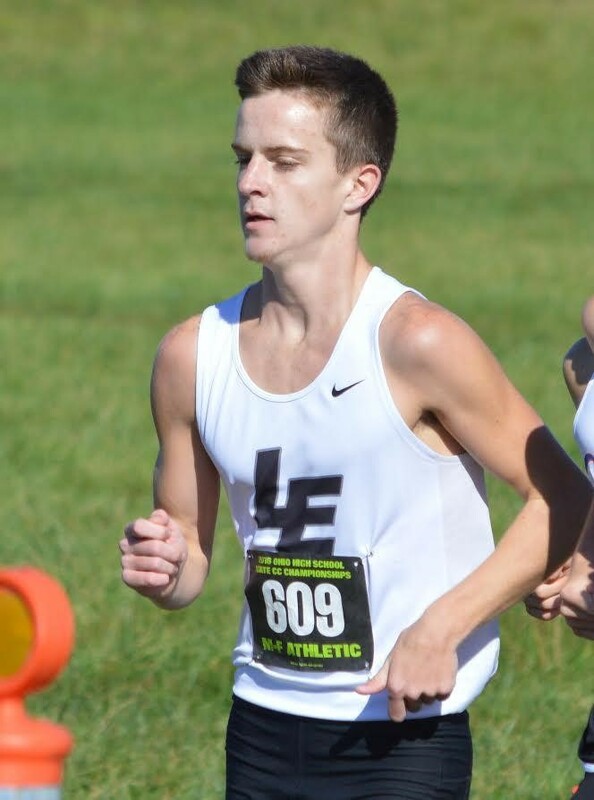 DI Boys Athlete of the Year - Dustin Horter of Lakota East - The sophomore was third at the state meet to garner all state honors, won the regional, the VOA district, and the GMC with a personal best time of 15:11. DII Boys Athlete of the Year - Ryan Estes of Clark Montessori - The sophomore was 57th at state, 13th at the regional, and won a VOA district championship. DIII Boys Athlete of the Year - Chase Gardner of Seven Hills - The junior was 26th at state, 5th at the regional and won the VOA district title. 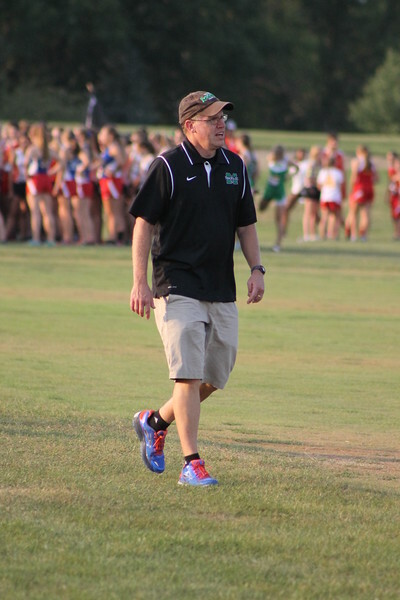 Di Girls Coach of the Year - Chip Dobson of Mason - Led Lady comets to a third place finished at state, a runner-up at regional and an impressive win at VOA district with six of the top ten spots. DII Girls Coach of the Year - Terri Thomas of Mariemont - Led the Lady Warriors to a 5th place at regional and a VOA district title. 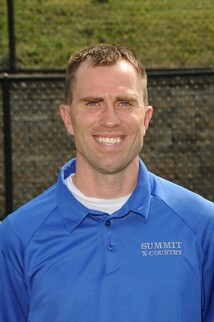 DIII Girls Coach of the Year - Kurtis Smith of Summit Country Day - Guided the Lady Silver Knights to a district title and a 10th place finish at regional. DI Boys Coach of the Year - Tom Rapp of Mason - In his 10th year as head coach of the Comets, he led his team to a state runner-up finish at state and GMC, district, and regional champships. DII Boys Coach of the Year - Kelley Shebetka of Badin - Guided the Rams to a VOA district championship and a 6th place finish at the regional. 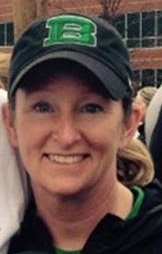 DIII Boys Coach of the Year - Tana Luckie of Seven Hills - Coached the Stingers to a VOA district runner-up spot and a 9th place finish at the regional. In Division III girls, Laura Vilardo of Miami Valley Chrisitian Academy was our only qualifier. 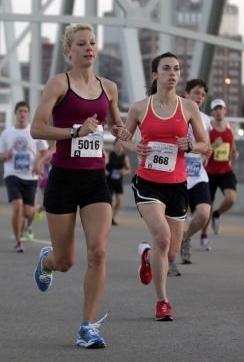 She finished 94th in 20:58.7. In Division II girls, Alayna Garver of Monroe finished 28th in 19:20.8, Rachel Ploeger of Monroe finished 35th in 19:28.9, Rachel Haslem of Cincinnati Hills Christian Academy was 77th in 20:09.8, and Emily Casaceli of Ross was 104th in 20:55.1. 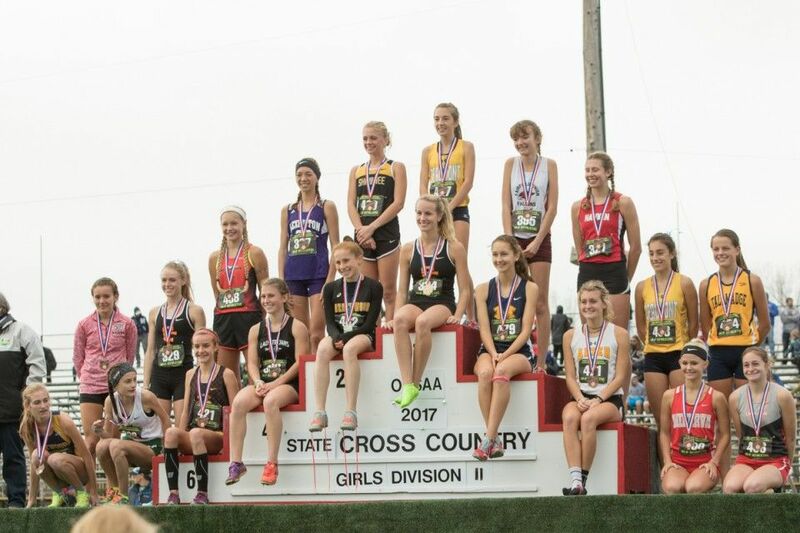 In Division I girls, Mason girls were second at first the one mile and two mile check points, but unfortunately did not make the podium as they finished third with 131 behind both Centerville with 71 points and Olentangy Liberty with 124. Maegan Murphy did make the podium finishing 15th in 18:27.3. Maddie Walker of Amelia also made the podium finishing 12th in 18:22.8. In Division III boys, Chase Gardner of Seven Hills was 26th in 16:31.1, Tullus Dean of Summit Country Day was 60th in 17:03.8, Matthew Marguardt of Seven Hills was 61st in 17:04.1, and Jared Boeckmann of Felicity-Franklin was 80th in 17:18.0. 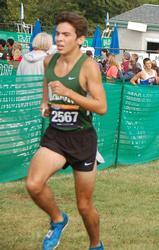 In Division II boys, Ryan Estes was the long qualifier. He finished 57th in 16:53.7. In Division I boys, Mason as a team did make the podium finishing 2nd with 96 points to St. ignatius who had 66 for the best team finish of our teams in any division. 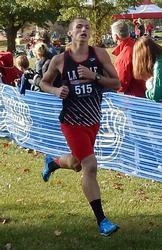 Dustin Horter of Lakota East was third in 15:14.4 for the best individual finish in any division. Zach Birdsall of Fairfield was a surprise 10th in 15:35.6 to also make the podium. In the preview, I stated we would follow all our district champions who made it onward and upward to the state meet. It's now time to report on who continued their season at Troy. DIII girls. Laura Vilardo of Miami Valley Christian Academy did make it out. 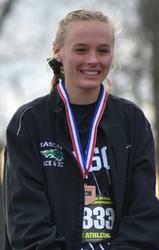 She was our DIII girls champion at West Chester and finished 16th at Troy in 20:12.54. No teams advanced. DII girls. Our DII, District 1 champion, Rachel Haslem of Cincinnati Hills Christian Academy, moves on as she was 9th in 19:23.09. 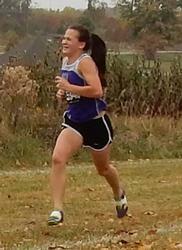 Our District 2 champion, Rachel Ploeger of Monroe, also advances with her 5th place time of 19:06.57. 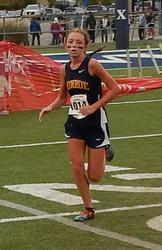 Ross' Emily Casaceli, the District 2 runnerup to Ploeger also advances with her 13th place time of 19:31.25. 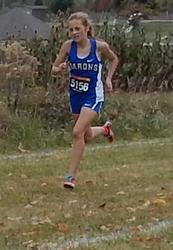 Rachel's Monroe teammate, Alayna Garver, moves on to state with her13th place time of 19:30.25. No teams advanced. DI girls. Our District 1 champion, Maegan Murphy of Mason was 6th in 18:21.07 while our District 2 champion, Maddie Walker of Amelia was 5th in 18:17.66, also moves on. Both our district runner-ups also advance to state as District 1 runner-up, Erica Schloemer of Seton was 11th in 18:50.88 and our D2 runner-up, Samantha Bush of Turpin, led all West Chaster individual qualifiers with he 4th place finish in 18:12.56. Mason girls qualify as a team and two other girls follow in Murphy's footsteps in finishing in the top 16 spots with Lily Hallum 12 in 18:53.67 and Ellie Brush 15th in 18:55.10. DIII boys. Advancing to state were Jared Boeckmann of Felicity Franklin who was 10th in 16:39.95, Matthew Marquardt of Seven Hills 6th 16:26.93, and Dean Tullus of Summit Country Day in 16:52.41. Our DIII district champion, Chase Gardner of Seven Hills, finished 5th in 16:26.43. No teams from West Chester made it out. DII boys. No teams made it to state from West Chester district meets. A lone individual made it out and he was our DII District 1 champion, Ryan Estes of Clark Montessori, who finished 13th in 16:25.97. DI boys. We swept the top three spots as Mason (35), St. Xavier (62), and Sycamore (105) all continued their season onward to state. Both of our district champions moved as Zach Birdsall of Fairfield, District 1 champion, was 3rd in 15:50.25 and our District 2 champion Dustin Horter of Lakota East won the race in 15:23.49 as became our only individual regional champion. I have put pictures of all ten of our district champions in the featured athlets's section at the top of our web site. We will follow all ten of our district champions as they pursue more glory at the the regional and state meets. Here are all 30 of our regional qualifying teams to the Troy regional next week on October 31, 2015. A special salute goes out to the teams listed in bold below for winning team district championships. 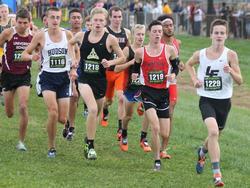 DI Boys: Mason, Sycamore, Anderson, Kings, St. Xavier, La Salle, Lakota East, Oak Hills. DI Girls: Mason, Lakota West, Seton, McAuley, Turpin, Lakota East, Kings, Ursuline. DII Boys: Indian Hill, Clark Montessori, Taylor, Badin, Mariemont, Madeira. DII Girls: Mariemont, New Richmond, Indian Hill, Wyoming, Ross, Monroe. DIII Boys: Summit Country Day, Seven Hills, Cincinnati Country Day. St. Bernard. DIII Girls: Summit Country Day, Miami Valley Christian Academy, Cincinnati Country Day, Cincinnati Christian. Top girls Individuals were 1. Eric Schloemer - Seton - 19:20.2, 2. Audrey Laiveling - Seton - 19:25.1, 3. Alex Stevens - Mercy - 19:25.2. Grils team results were somewhat of a surprise as Ursuline easily won with 59 over St. Ursula 69 and Seton 81. St. Ursula appears to be favorite in the this based on previous results this season. 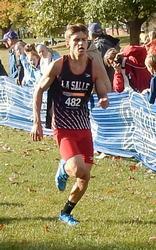 In the boys race, La Salle's Brad Anneken was the winner in 16:01.5 defeating St. Xavier's Austin Angeline in 16:05.8. Frank Pierce was third in 16:12.5. In the team results, St. Xavier and La Salle staged a classic struggle with the Bombers edging out the Lancers by a mere two points 29-31. Lancers get a rematch at the district meet as both teams run in the "B" race. These are the kids from Oyler wearing the unforms supplied by our Association. Here are some sobering statistics about these kids background. 49% of the household in lower Price Hill earn less than $15,000 a year. 45% pay rent at or above 50% of the household income. 99.6% of Oyler high school students qualify for free lunches. 1/3 of the students at Oyler are homeless. Crime in the neighborhood is 7 times the national average, 4 times the Hamilton Country average, and twice the average of the city of Cincinnati. Oyler has a graduation rate of 41%. Drug abuse, especially heroin, it tearing the community apart. Life expectency in lower Price Hill is ten years lower than the rest of the city. Sources: US Census Report, Realtor.com lifestyle and demographics, City of Cincinnati Department of Planning and Buildings. Week Six Featured Meet Review - St. Xavier Inv. In Boys DI, Lakota East's Dustin Horter won much easiler than expected beating Highlands Ethan Shuley 15:53.34 to 16:08.58. 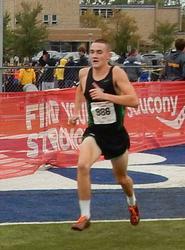 Meade County's Logan Greco was 3rd in 16:35.61. 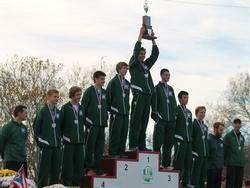 Host school St. Xavier as expected won the DI boys team race with 57 points over a surprising Mason "B" team with 91. Can we vote for Mason "B" in the city poll? The DII boys team rece once again was classic struggle between Badin and Indian Hill as the Rams edged out the Braves by a single point 89-90. As expected, Jessica Hartman won the DI girls race, but unexpectedly, Mason brought their mares to this meet and took the next two spots with Maegan Murphy getting second in 18:59.43 and Ellie Brush taking third in 19:42.06. With the Mason DI girls nearing post-season form, they dominated the team scoring with 32 points to second place Lebanon's 96. In DII girls, individual honors went to Highlands Lauren Ossege in 20:03.85, runner-up was Rachel Ploeger of Monroe 20:14.08 while Monros's Alayna Garver was third in 20:31.19. Ft. Thomas Highlands took the team award home to Kentucky with 49 points while Monroe's powerful 1-2 punch (2nd and 3rd overall catapaulted them to the runn-up spot edging out thrid place Mariemont by four points 109-113. Week Five Featured Meet Review - Harrison Inv. In the girls race, South Oldham's Hallie Searcy won in 19:36.6 while Colerain's Madelyn Frey was runner-up in 19:57.4. South Oldham and Colerain actually tied for the team championship with both totaling 52 points. 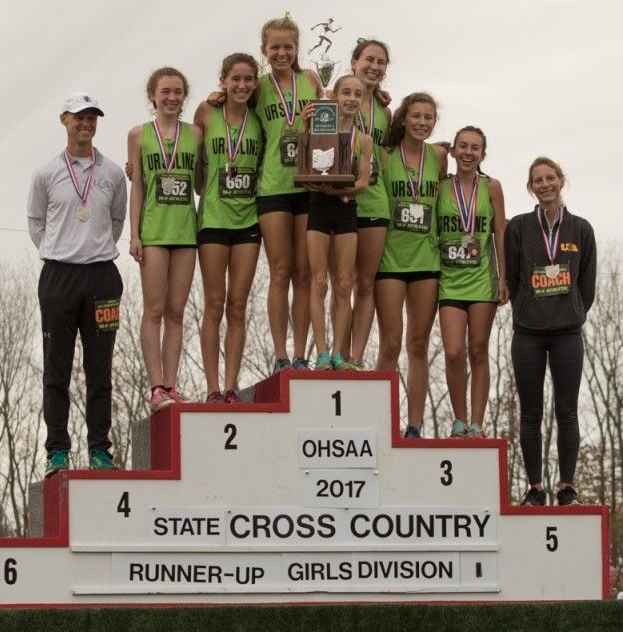 By rule, a tie is brokern with the sixth runner, so South Oldham won becuase their sixth finished 43rd while Colerain's sixth was 56th. This is an important point to emphasize to your runners. The sixth finisher on your team can play a role in beating another team. This race points up another facet on cross country coaching. 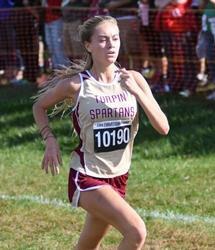 Turpin and Seton both didn't run their top girls. Seton's coach, Karen Berling, says they started holding their top seven runners out of some meets during the season last year and it has worked out well for them. Pictured below are the top two finishers in the girls race: Searcy (L) and Frey (R). In the boys race, South Oldham's Tanner Dowdy won in 15:55.8 with Cole Dowdy second in 15:58.5. South Oldham also got third for a powerful 1-2-3 punch. Elder made it interesting with a 5-7-9-11-14 pack to only lose by five points to the Kentucky powehouse 41-46. Elder's veteran coach Steve Spencer has emphasized pack running for decades as Elder became known as the purple pack. A 1-2-3 finish is difficult to overcome but Elder maded it interesting. Once again we saw a team not running their top people as the expected dual between Dustin Horter of Lakota East and the South Oldham runners never materialized. Picutred below are the two brothers from South Oldham running away from the field. A total of 465 runners ran in the four races. Meet director Scott Menze thanks all who competed in this year's meet and hopes that everyone had a great time and a competitive race! At our featured meet for week four, the Milford Eagles Invitational held at Valley View Nature Preserve, the girls varsity race had 99 finishers with thirteen teams scoring (Trupin entered two teams). 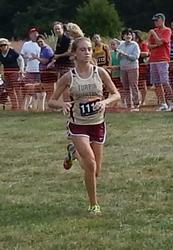 As expeced, the overall winner was Sam Bush of Turpin with a winning time of 19:08.4. 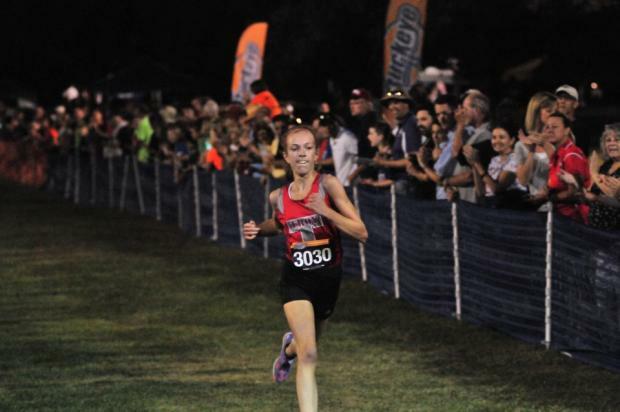 Her top time is 18:53.80 from the Queen City Invitational where she finished as runnerup. She is picutred below (on left) winning the Milford Eagles Invitational by some 36 seconds along with her teammate (on right) who was thrid in 20:12.3. 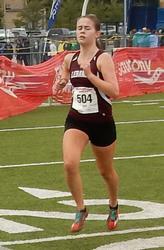 Clark Montessori's Rachel Haslen was second in 19:45.2. As expected, the girls team race was close between St. Ursuala and Turpin with St. Ursula edging out the Spartans by seven points 42-49. The biggest surprise to me was Marin Valentine winning the Section II girls race in 20:16.3 and leading Mariemont to the team title as they easily defeated second place Celina 50-81. 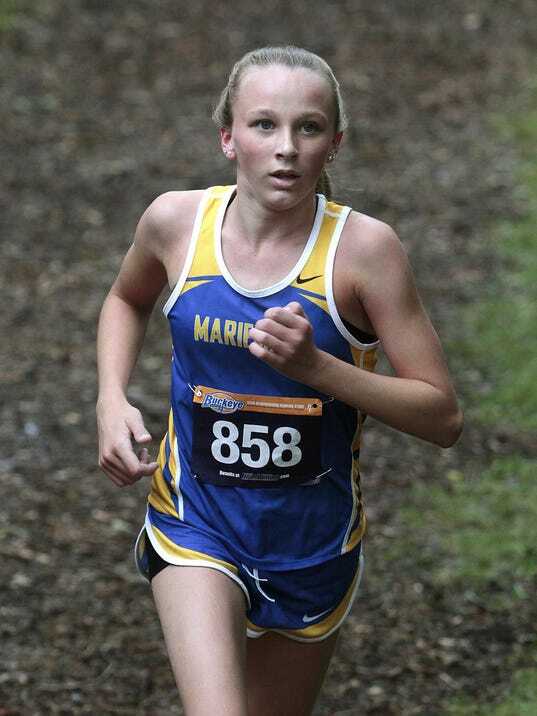 I guess I shouldn't be surprised since last year Marin was second at the Ohio Middle School State championship running two miles in 11.43.34 and leading Mariemont to the Middle School DIII girls state championship with 34 points. 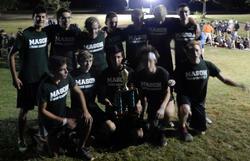 Mason boys and girls both won the Section I races at Mason as expected. The girls were led by Maegan Murphy's fourth place finish (19:07.2) while the boys were led by Allen Giordillo's 5th place finish (16:32.0). It looks like Mason girls will battle Centerville while Mason boys will battle St. Xavier for Region 4 championships. Freshman Maddie Walker won her second rece of the year in winning the Queen City Invitational in her fastewst time of the year in 18:40.3. She also won the Finishtiming Invitational in 18:47.1. She appears to be the leader for the VOA Southwest district at this early point in the season. Dustin Horter also won his second race of the year with his fastest time of the year in 15:21.4 in achieving his goal of setting his career best time at this meet. 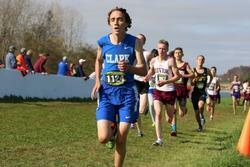 He also won the East Classic the previous week in 15:46.2. At this point in the season, he has the second fastest sophomore time in the USA according to milesplit. By going 1-3-11-18 and 25 in the 373 runners field, Lakota Easy easily won the Queen City Invitational boys division over Anderson 58-115. Let’s take a look at how our boys preview came out. We picked Beavercreek’s Ben Ewert to win. He ran a solid race and finished fourth. Ben will be a factor in Southwest Ohio as the season progresses. 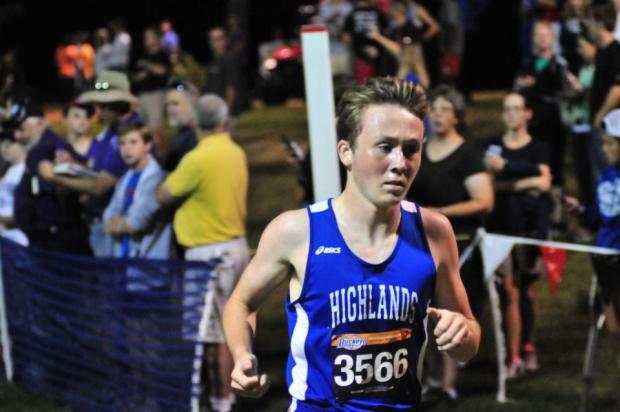 It’s doubtful anyone could have beaten Highland’s Ethan Shuley who smoked the course with an astonishing 15:32.1 destroying Evan Stifel’s course record of 16:09.49. We said that Hunter Moore of Orange would be in the hunt and he was the runner-up as one of two runners who broke 16:00 on the course. Brandon Morrow of Orange was indeed a top finisher as he came in 8th . St. Xavier’s Austin Angeline also made the top ten award call out with his 5th place finish. Allen Gordillo of Mason (9th) and Jake Bauer (10th) of Mason also made the podium as predicted. 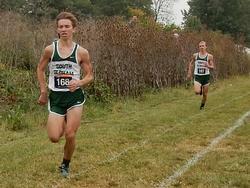 One surprise was Ray Berling (6th) of Mason as their top finisher who we didn’t have listed as a top contender. Troy’s Steven Jones also turned some heads with his 3rd place finish and one of three who broke Stifel’s course record who was not expected to be among the top finishers. Turning now to the boys team race preview, we said Mason and Orange would be too close to call with St. Xavier also making their presence felt. The actual results showed Mason (55) beating Orange (91) but St. Xavier 82 also finishing ahead of the boys from Columbus. Looking at the girls results, we blew it on the overall winner Maegan Murphy. In fact, two of her own teammates Ellie Brush (2nd) and Ailee Henderson 6th finished ahead of Murphy’s 7th place finish. Unhearaled Leah Maschino was a surprising 3rd. Jessie Hartman of Lebanon was up there as expected with her 4th place finish. Beavercreek had two in the top ten with Lauren Shuman finishing top five as expected. Like the boys race the girls winner was dominant winning by 39 seconds in 18:15.9 top put her third on the all time list behind Annie Heffernan’s junior and senior times but ahead of Heffernan’s sophomore time. Like the boys winner the girls winner, Morgan Gigandet of Troy was an unexpected champion with a time of 18:15.90. The girls team championship was not as close as expected with Mason winning with a dominant total of 35 over second place Beavercreek’s 93. 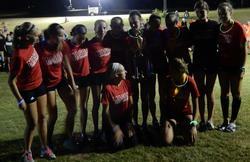 Pictured below are the Mason girls champions. Registration will be on GHG timing and will be CHIP TIMING. Coaches please have athletes car-pool, there is a limited number of parking spots on site. Busses are welcomed and given a priority. Site is spectator, coach and runner friendly! Team camping areas are near the finish line – please leave at least ten feet to the course. Please no footballs, soccer balls or Frisbee tossing.A trainer will be available near the finish line. Grant Stanley is our registered Official. Awards: - Buckeye Running Company will provide T-shirts for the top 50 runners in each race. Directions are from I-75 Exit #24, Rt. 129 West. West on Rt. 129 toRt. 747, Princeton-Glendale Road, Exit #21. Turn right (north) on Rt. 747 to Princeton Rd. (approx.1/2 mile). Turn right (east) on Princeton Rd. The Lakota Plains Junior School is on the left approximately 3/4 mile.